Discussion in 'General Cycling' started by BS Slarver, Jul 4, 2018. Nice to see the addition of the cycling section here. Looking for pug opinions on the practicality and primarily the security of bike carriers for both roof and hitch. As some of you here know the Catskill show is packing up and moving out west. A last-minute sale of our existing sprinter van will leave us even more cramped for space so we are considering a bike rack. Currently we own Thule bars and Cargo box so the roof option seems the simpler, more cost effective way to go. Car has a hitch and will be towed so ther is that option also. A new sprinter van with hitch will be waiting for us in MT, so advantage to hitch again ? The roof racks could also be modified to be mounted in the floor of the van. Tony S and Monique like this. Perhaps I should have added a poll to the topic - That’s 2-0 in favor of hitch / tray. Obviously a hitch lock would be needed, anyone have suggestions for lockable carriers for either hitch or roof applications? We have a hitch mounted tray rack. A zillions times easier to use than any roof carrier I have ever had and quite secure. The mount does lock but a determined thief could probably get it off fairly easily. The rack came with built in bike locks but we just use our regular cable combination locks. scott43 and BS Slarver like this. I have a Kuata hitch rack which has built in locks. I always add a bigger lock which attaches to the hitch but I don’t leave it unattended for long. If I was going to leave it longer I would add a massive chain lock to the mix. Thanks @coskigirl - it’s the night time sleep segment I worry about while trekking cross county next month, might have to consider bringing the bikes into the hotel room each night. didn’t think the move was going to be easy. I would never leave bikes on any rack overnight. Even when camping my mountain bike comes in my tent with me and then I lock wheel to frame. Yes, I’m paranoid but bike theft is rampant here. Ken_R, Monique and T-Square like this. I used to be a traditionalist and liked the Thule 529 fork mount but that was before mountain bikes with 15mm suspension forks. I never lked the uprights on the roof after that. The tray mounts on the back are the bomb. Hitch rack with trays type.. and if you are gonna leave the bikes on there for any period of time, get some super thick chain wrapped in fabric to lock up with. Don't forget a locking pin for holding the rack into your hitch as well. I dislike roof racks simply because they murder your gas mileage from lack of aerodynamics. Philpug, Tom K. and BS Slarver like this. I'm not sure I understand. Why not put the bikes inside a moving van with the rest of your stuff? Are you moving accross the country and not bringing any furniture with you? Did U-haul suddenly increase their prices? As to what I would use to cart a bike around if I could afford it, hands down, it's the hitches mentioned above in prior posts. Who want's to be getting their clothes all dirty leaning against the vehicle putting a bike on the roof? 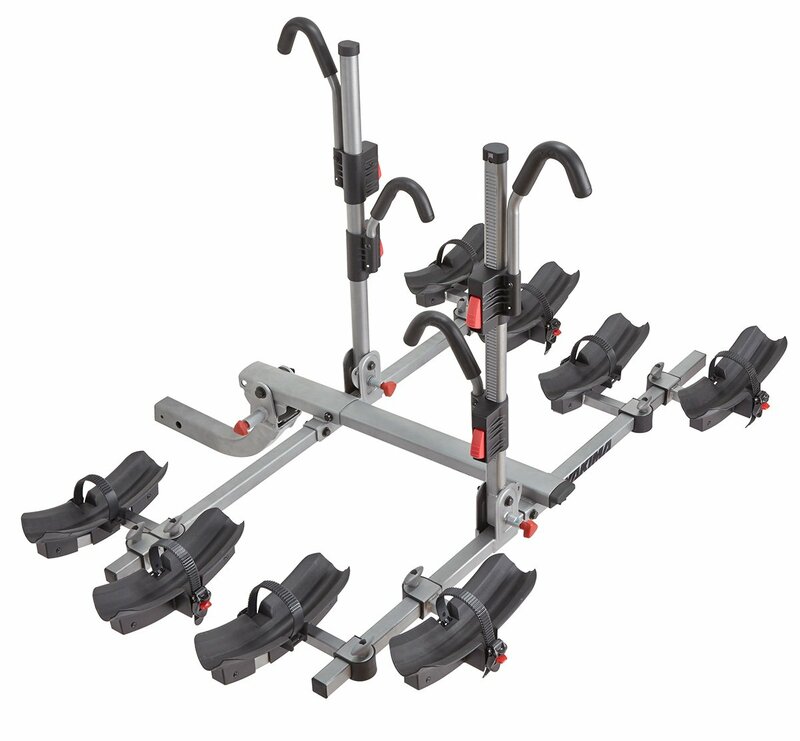 +1 on hitch mounted platform bike racks. Just bought in on the 1up USA 2x heavy duty plus two add ons for my 4Runner. This solution was for family of four biking and today was our first use. Gotta say the ease to put up and take off 4 bikes was better than I expected. The weak spot in this system is lack of locking. I purchased masterlock 15' cable and keyed lock which worked well. It's a deterrent, not protection from theft. One caution is that the cable has a lot of memory (stiff) and storage is a little bit of a challenge. In the past, my bikes had quick release skewers on the front forks and generally it would just be me and maybe another. The fork mounted roof rack worked, especially with the integrated lock. This solution is on my sports wagon. But now, better mountain bikes have thru-axles which makes the roof solution more difficult. (Yes, I've got this solution for when it's just me.). That and coupled with the larger number of bikes on trips, the platform is the way to go. Anyone need a Thule echelon roof rack bike tray or two? Oh, +1 @François Pugh inside the moving van idea. Get the bike rack solution later for bike trips. We’ve been planning the move to Big Sky for quite some time and we anticipate 4-5 days on the road. We may even want to stop along the way and bike for an hour or two. We are renting the largest U-Haul 26’ along with towing the wife’s car packed and Thule crammed as well. The problem here is at the last minute we got a very generous offer on our second vehicle -the largest MB sprinter 3500 high top cargo van which had an additional 18’ of cargo space and now we are really strapped for space. We have a new sprinter coming but it is being delivered in MT after we arrive. Some things that we were going to take are now not making the cut, but we are not leaving the bikes behind. Aside: save your very lightest, highest volume things for packing in the towed car. That car will be overloaded (weight-wise) before you realize it. BS Slarver, oldschoolskier and Erik Timmerman like this. Hitch. There are two hitch sizes; I suggest getting the correct size for your hitch rather than getting an adapter. They are not usually as tight as you would like them to be so you want to avoid any additional play in the linkage. My friend was driving out west and killed an expensive roof mounted bike on a low bridge. There are a bunch for sale on Boston craigslist and probably are in NY too. Since you put the cart before the horse so to speak (got rid of the old van before the move), I might suggest a trip with your new van, put the stuff in storage and pickup later. The extra trip may be less costly than damages or an accident overloaded, as I don’t think a rack is the solution at this point you seem over capacity anyway. skibob and BS Slarver like this. Another random thought. Putting a hitch rack on a towed car might be a mistake. Are you using a dolly? The front end will be in the air meaning the hitch will be lower than usual. Its going to strike every little irregularity. And transfer that energy to your car and bikes. Consider top loading your bikes in the box. I used to run a moving crew and I was the best packer (har-har, yes, I've heard that joke before) in the company. Nobody, not even the best, can use 100% of the top space. But bikes are ideal top load because they are bulky and light. Just remember, the load will move. So make sure those bikes are properly restrained. The last thing you want to do is force the door open with your precious bike against it. Also, if you haven't already, watch a few videos on how to load a moving truck. I had to learn on the job 30 years ago, but you don't have to. Base+box+top load is a religion in moving for good reason. Also, put everything in a box that will go in a box. Everything. The more uniform your load, the more you get in. Dead space in a box is more than offset by uniformity in load. Take the time to load it right. When I ran a crew*, I rarely carried furniture because it takes as much or more time to load the box properly than it takes two other guys to carry things out to you. You will also be rewarded with less breakage. I had exactly one broken item in 4 years of moving furniture. And I was able to repair it before it left the truck and the customer saw it. .
*I was 19 when I started. I was in charge immediately because, as the owner said, "I know you won't drive my trucks drunk or stoned and you won't yell at my customers". Tony S, BS Slarver and Monique like this. Yet another vote for a tray-style hitch rack, for all the reasons given. It's much more convenient - and a lot of modern mountain bikes have through axles, making roof mounts even more of a pain than they used to be. It's far better on fuel. That being said - roof or hitch or anything, bikes are easy to steal, and actual bike thieves aren't much hampered by any sort of lock. Watch videos on any type of lock/chain in existence - it's frightening how quickly they can be cut with the right tool. Bikes have been stolen right out of my local grocery store's parking lot. I always bring my bikes into the hotel on road trips. I have a great hitch rack, but when I have it in my car for any amount of time, I shove and prod it into the back of my car with a blanket obscuring the form. Unfortunately, this only works for a single bike, and it leaves me with no space for anything else. If you hadn't planned to ride them on the trip, disassembling them and putting them into bike boxes would actually be a pretty good idea. BS Slarver and skibob like this. Thank you all - great advice.